Whether you’re a casual photographer who is learning the trade or an experienced photographer who snaps photos for a living, you know that presentation is everything. When it comes to creating a WordPress website to show off your photos, you want only the best; while the standard WordPress theme is more than suitable for showcasing your online portfolio, a custom WordPress theme specifically for photography will make your photos pop off the page. We’ve found 30 of the best WordPress themes for photographers that are guaranteed to make your photos the star of your website. 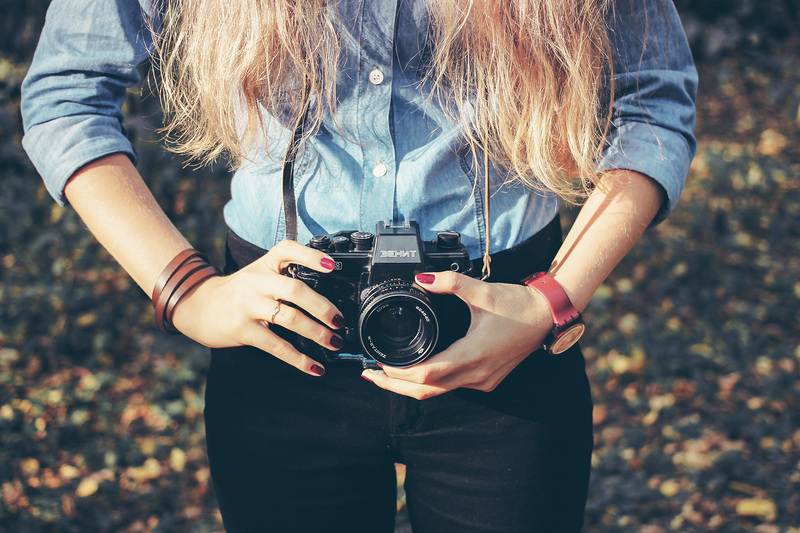 Whether you’re a WordPress novice or a master at manipulating the inner workings of the site, you’re sure to find a WordPress photography theme on this list that you’ll love. 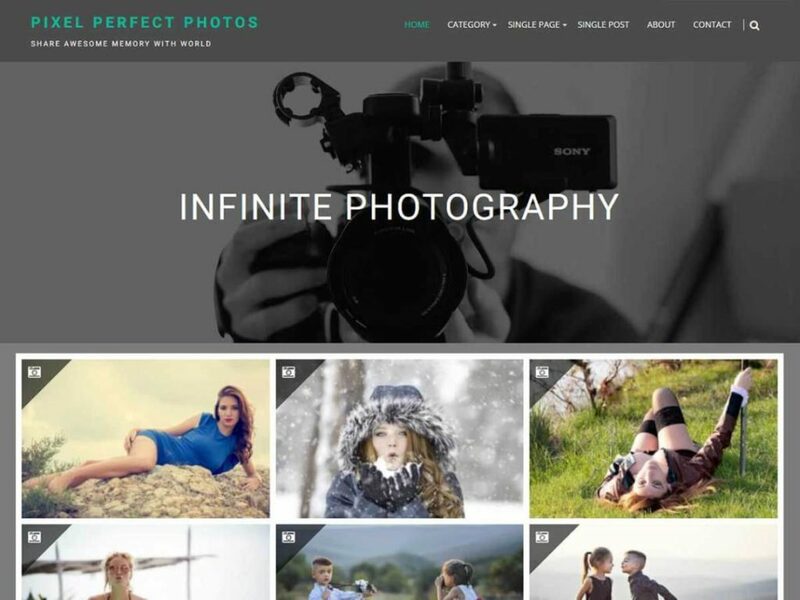 The aptly named Infinite Photography WordPress theme is designed with photographers in mind; it’s a quick, responsive theme that works on a number of devices, including the PC, iPad and most smartphones. This theme makes uploading your photos a simple process and even lets you use one of your photos to create a custom background. The customization options don’t stop there, as the Infinite Photography theme allows you to add a custom logo, change the layout of the home page and even customize the number of sidebars. This WordPress theme also supports threaded comments, letting your viewers comment on their favorite photos or offer suggestions for you to use on future shots. The Revolve WordPress theme is a sleek theme that offers something most WordPress themes lack: a vertically-scrolling fullscreen slider and side menu. 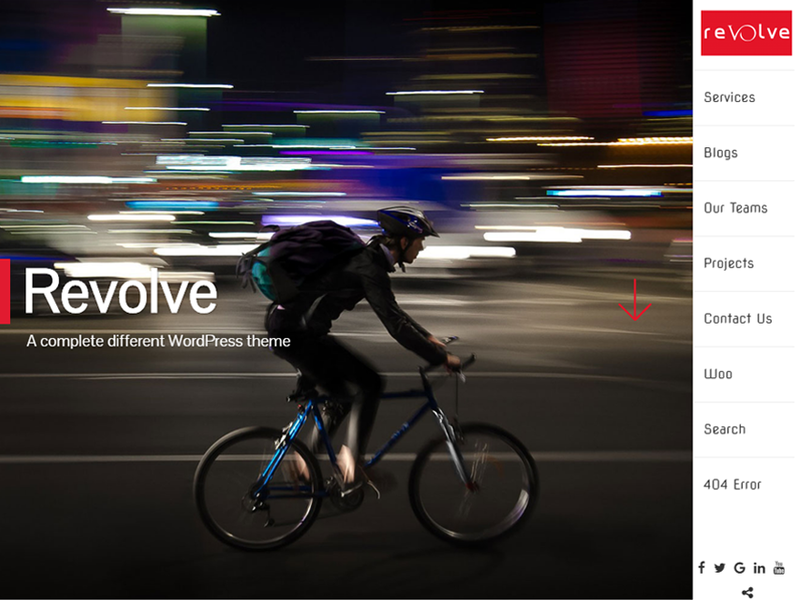 The Revolve WordPress theme is a multi-purpose theme; while photographers will love the emphasis it places on pictures, other occupations such as chefs and designers will love its features as well. 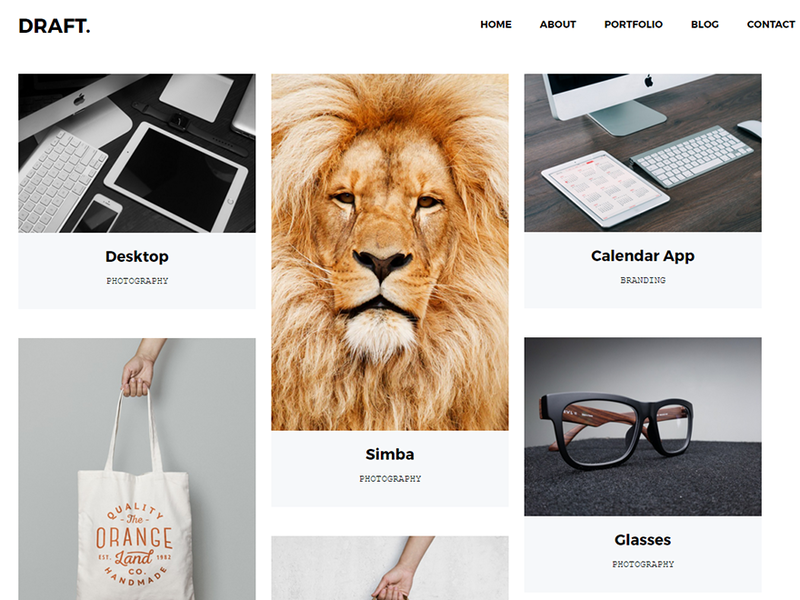 The Revolve WordPress theme is perfect for building your photography portfolio thanks to its array of customization options and is fully compatible with plug-ins such as WooCommerce. The Revolve theme is also SEO friendly, letting you take advantage of search engines such as Google and Bing to draw new readers to your website. Not only does the Revolve WordPress theme come with full documentation but a virtual walkthrough is also available. The iPhotography theme will make sure your photos reach a broad audience; not only is this theme compatible with multiple Web browsers, including Internet Explorer 9 through 11, Chrome, Firefox and Opera, but it’s also compatible with a number of devices as well, including smartphones and PCs. 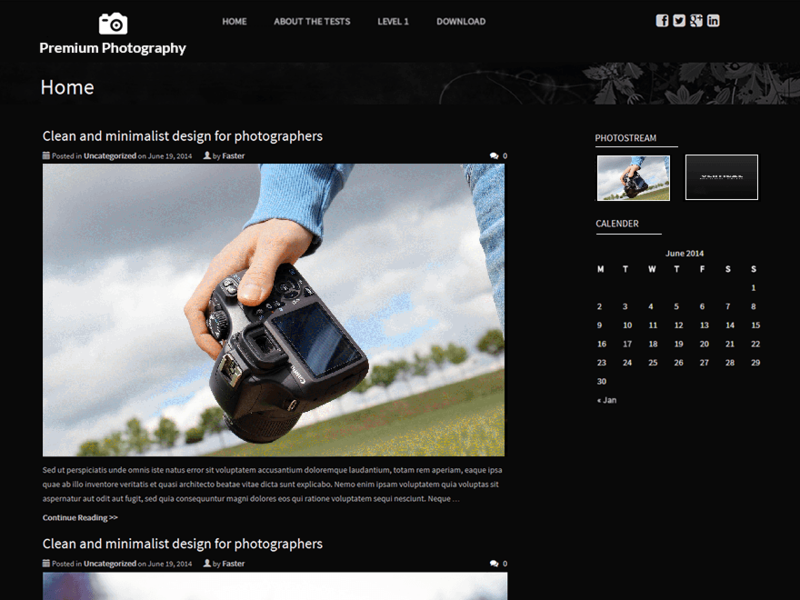 This theme is ideal for those who have made photography a profession as it features a customizable header logo, footer copyright text and a multi-level drop-down header menu. The slider images let your readers quickly move from one photo to the next, which makes the iPhotography theme ideal for those looking to showcase a portfolio on WordPress. While this theme is more suited towards the professional, casual photography fans will also find that it’s easy to adapt it for a photography blog as well. With a name like Premium Photography, you’d expect this WordPress theme to come packed full of features and luckily, this theme delivers on its name. The Premium Photography theme may have a minimal, clean presentation but under the hood, it’s loaded with extras, such as social media integration, favicon support, the ability to change the logo and even the option to add copyright text to your photos and blog posts. This theme also includes a custom widget that will display a featured image along with your latest post. While this theme is ideal for photography fans who want to showcase their portfolio, travel enthusiasts and technophiles will also love what this theme has to offer. While some themes attempt to be a jack of all trades, the Draft Portfolio theme focuses all of its efforts on one bullet point: showing off your amazing portfolio. This minimalist theme is sleek and responsive, putting the emphasis solely on your amazing photos. While this theme is light on customization options, it does offer the ability to create a custom background along with custom menus. The threaded comments featured in this theme allows your viewers to not only leave comments about your photos but also lets them reply to other commenters as well. This theme is translation ready so you can maximize your views, allowing you to reach a global audience and find not only new fans but also new clients. 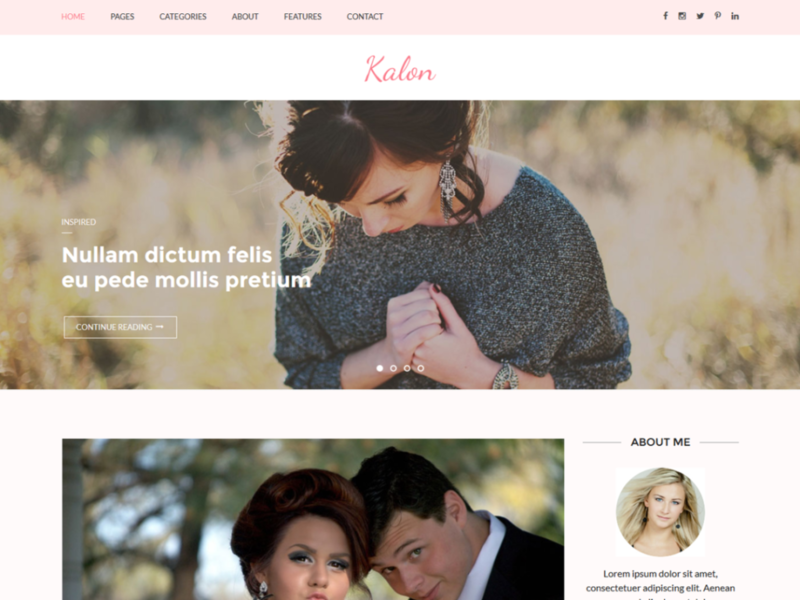 While most of the photography WordPress themes featured so far are for general use, the Kalon WordPress theme is best suited for photographers who focus on wedding or baby photography. The developer describes this theme as a “feminine theme” due to the soft colors and rounded edges, which are perfect for showcasing life’s gentler moments, such as the birth of a new baby or engagement photos. The spacious layout of this theme not only gives you plenty of room to show off your photos but also ample space to pen a short story about each one as well. The SEO friendly design of the Kalon WordPress theme lets you quickly rocket to the top of Google’s rankings. This theme is not only compatible with both mobile and PC devices but is also compatible with every major Web browser, including Firefox, Internet Explorer, Chrome and even Opera. The Kalon WordPress theme is one of the fastest loading WordPress themes you’ll find, as the developer continuously tests and tweaks this theme to provide optimal load times. Finally, the Kalon WordPress theme includes social media integration, letting you and your viewers post links to their favorite photos directly to social media platforms such as Facebook and Twitter. Similar to Draft Portfolio, Elicit is another minimalist theme that works fantastic for photographers wanting to show off their portfolios. 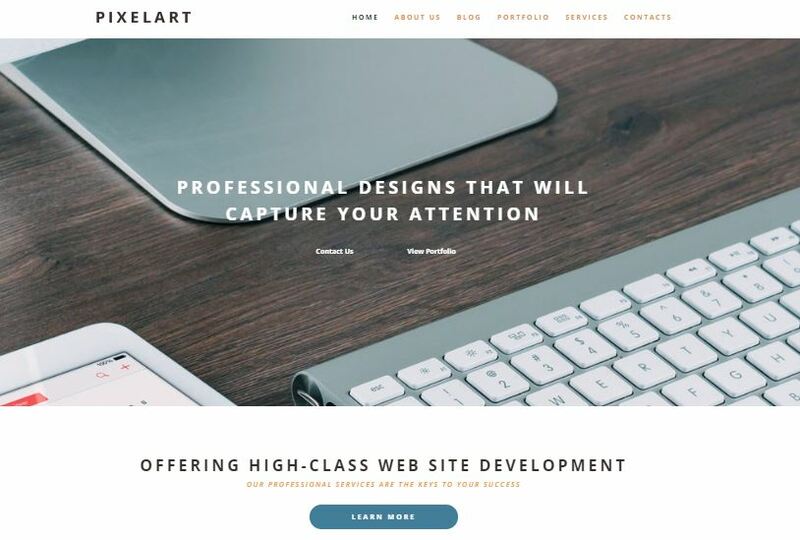 WordPress novices will love how easy it is to get this theme up and running while experts will enjoy how many customization options the Elicit theme offers. With five widget areas, you can fine tune this theme to provide a professional look that will make your portfolio stand out from the crowd. Elicit supports all the main WordPress plugins, is compatible with all major browsers and works on both mobile devices and PCs. While some readers may want to use a WordPress photography theme to share their photos casually, others are looking for a WordPress theme to help sell their work. 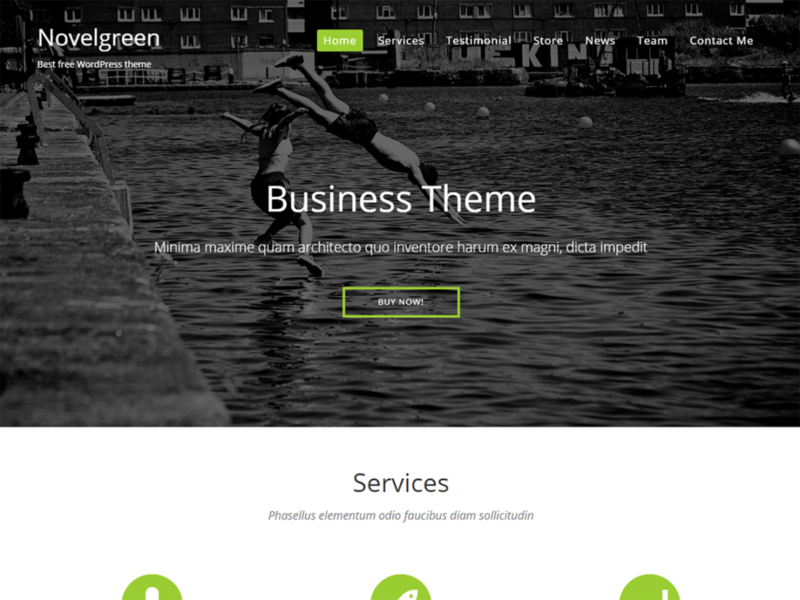 The NovelGreen WordPress theme is a WordPress theme for the latter, featuring built-in WooCommerce support so you can easily sell prints to your fans. In addition to selling your work, the NovelGreen theme also includes sections for a contact form, testimonials, a gallery and even an About page. With support for six Widget areas, this WordPress theme offers a professional look on par with the biggest online retailers. If you’re a photography entrepreneur who is ready to turn your hobby into a business, the NovelGreen WordPress theme is an excellent fit. 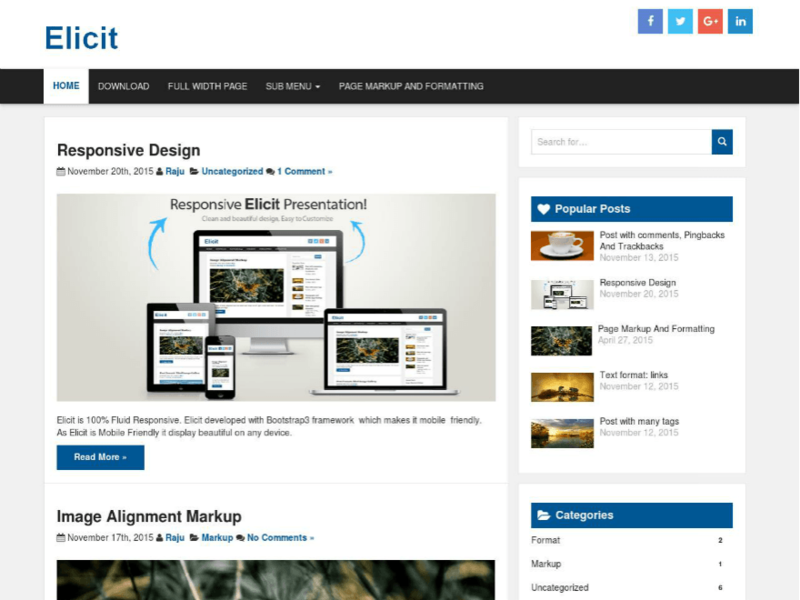 In addition to these features, the Photolite WordPress theme also boasts compatibility with all the main Web browsers and loads extremely quick. This theme uses a generous number of sliders, meaning that WordPress novices will have no problem customizing it. 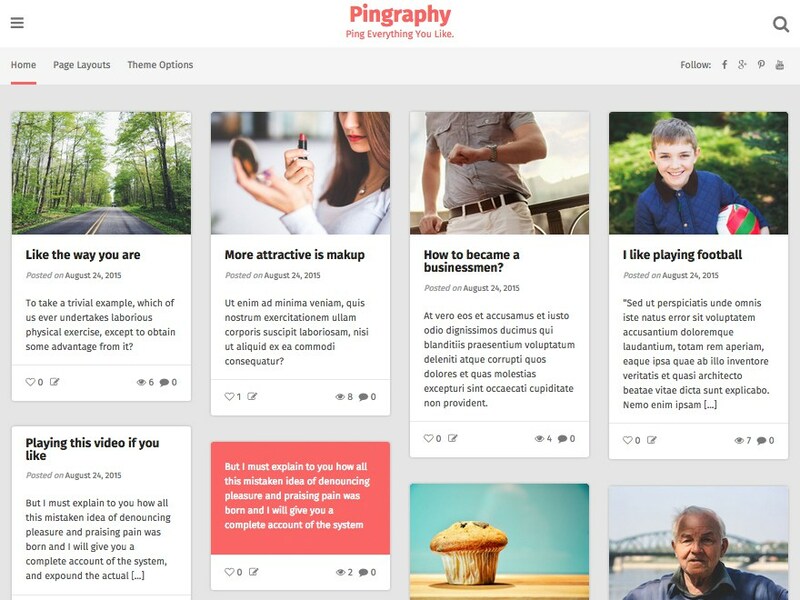 Pinterest is one of the premiere websites to share your photography, and the Pingraphy WordPress theme brings the feel of the Pinterest website right to your very own blog. This theme mimics the Pinterest layout, creating a familiar atmosphere that both you and your readers will love. This four column theme gives you ample room to display all of your photos while the responsive layout will ensure your website loads fast no matter what device it’s on. With the ability to customize both the colors and the menu, the Pingraphy WordPress theme lets you adjust your website to match your personality. Just like it says in its name, the Responsive Photography WordPress theme is a fast loading theme that will have your website fully loaded in a matter of seconds. With eight menu layouts to choose from and the ability to customize every aspect of this theme, no two instances of Responsive Photography will look alike. If you don’t have the time or skill to design a custom theme, the Responsive Photography theme includes over 70 prebuilt designs for you to use. The Infinite Scroll feature on this theme is ideal for a portfolio, letting your readers go on a non-stop journey of all of your photographs. 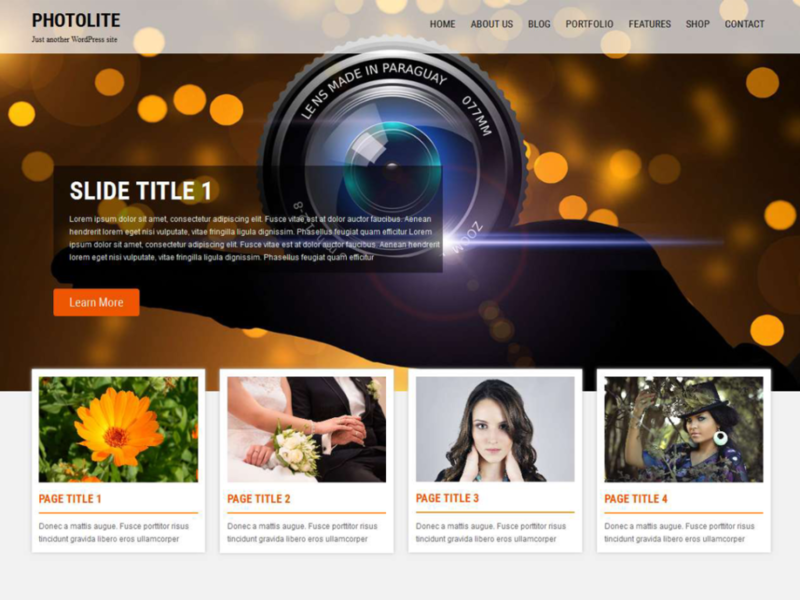 The Etudes WordPress theme puts as much emphasis on the photographer as it does the photos. The minimalist design of the website keeps your viewers’ eyes on your photographs at all times while the numerous galleries let you group your images in the best possible way. If you want to add a bit of written content to accompany your photos, the journal section of the Etudes WordPress theme lets you chronicle the history behind each picture. The Etudes WordPress theme also offers a few different options for a contact page, letting you share your personal information with potential clients. Lastly, this theme is designed with Retina displays in mind, meaning that users with an iPad or iPhone can view your photos in gorgeous high-definition quality. The Deliver Photography theme is geared more towards professional photographers, offering a bevy of features that will assist you in your career. The portfolio pages use a minimalist design to showcase your work, keeping a reader’s eye trained on your pictures and not on distracting UI elements. The about page lets you fill in as much, or as little, information about yourself as you want while the contact form lets prospective clients get in touch with you quickly. WordPress novices will love the detailed documentation that accompanies this theme, as it outlines nearly every feature of this theme and how to utilize each one successfully. While many WordPress themes are content on just using one slideshow, the Borano WordPress theme goes the extra mile by letting the user incorporate multiple slideshows on one website. 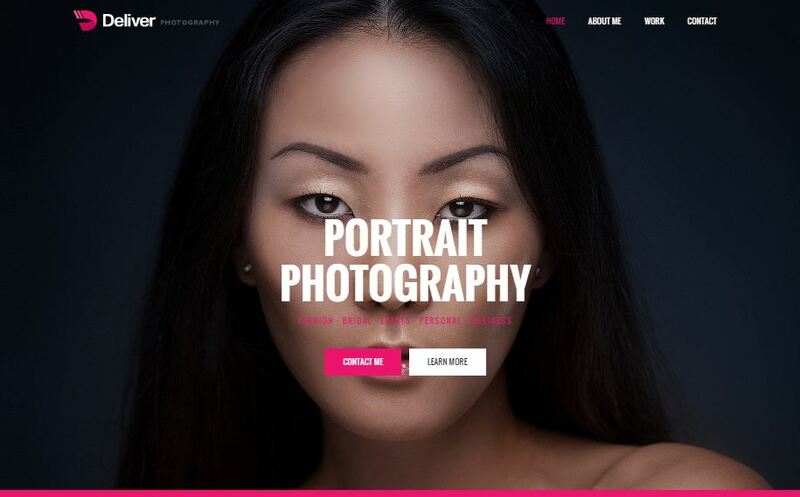 Couple this with a multitude of gallery layouts, landing pages, albums and the ability to filter a portfolio and you have one of the best WordPress themes for professional photographers. With the ability to also support Google Maps and a working contact page, the Borano WordPress theme allows prospective clients to get in touch with you quickly and easily. If you’re new to WordPress, tinkering with a theme can quickly turn overwhelming; within minutes, your WordPress website can look like a hot mess rather than a beautiful showcase of your photos. The Photoedge WordPress theme is built specifically for novices, featuring extensive documentation and copious amounts of sliders: building a WordPress site with this theme is as easy as using a mouse. The best part about the Photoedge WordPress theme is that it loads photos fast, letting your viewers spend more time looking at your beautiful shots and less time staring at half-loaded images. If you’re looking for a way to showcase your photos in beautiful high-definition quality, look no further than the Vienna WordPress theme. This theme is built specifically for photographers, featuring a minimalist design and support for devices with Retina screens. The Vienna WordPress theme lets you create both gallery pages and albums along with a stylish About page to showcase the person behind the camera. The best part about the Vienna WordPress theme is how easy it is to use, with the theme coming with not only documentation but also free updates and a dedicated support channel. The Agatha WordPress theme celebrates both quality and quantity, coming packed full of features that photographers will love. The Visual Composer and Revolution Slider plugins are both bundled with this theme, giving you over $50 of savings right away. The features of the Agatha WordPress theme don’t end there, as the theme also offers unlimited color schemes, a one-click installer, unlimited Google Fonts and even a massive collection of icons. When you’re looking to create a casual blog to showcase your photos and musings, you can’t go wrong with the Agatha WordPress theme. The TwoFold WordPress theme bills itself as a “premium fullscreen photography theme” and it’s easy to see why; not only does this theme offer seven home page layouts but it also provides six album and gallery layouts. The premium features don’t stop there, as the TwoFold WordPress theme also provides color-changing logos, animations and even filters. The TwoFold WordPress theme also features three photo hover effects, making your photos stand out not only to your readers but also prospective clients as well. If you’re looking to branch out into videography, the TwoFold WordPress theme lets you transform a photo gallery into a video gallery with the click of a mouse. Some photographers use their photos to tell a story, with each picture in a sequence being a new chapter in an epic adventure. The aptly named Adventure WordPress theme brings your adventure to life by offering a parallax scrolling feature that lets the reader experience the story as the photographer intended. Also, the Adventure WordPress theme also features multiple portfolios, custom-designed call-to-action boxes, an auto-play image carousel and the ability to add a link to any photo. If you’re looking for a feature-rich WordPress theme to tell a story via pictures, look no further than the Adventure WordPress theme. The SolarWind WordPress theme is another in a long line of minimalist WordPress themes; however, the SolarWind theme has a few features that make it stand out from the crowd. The combination of a custom fullscreen slider and ribbon slider let you easily drag and drop photos to your page and customize their size on the fly while the masonry layout lets you get more photos on the screen at one time. If you’re looking to switch it up, the striped page layout allows you to present images on the screen as stripes, creating a unique visual that you won’t find in other WordPress themes. Photography is a very lucrative career, but the one thing most photographers struggle with is a great platform for selling their photos. The eCommerce WordPress theme is the perfect way to sell your photos online to your fans. While the eCommerce WordPress theme offers the basics, such as a cart functionality, it also goes above and beyond by incorporating wishlist features, quickview options and SEO features to make sure potential customers find your website. The theme is not only designed for both mobile and PC users but also supports all major Web browsers, including smaller browsers such as Opera. The developer of this theme offers 24/7 customer support, even on holidays, meaning that you can get any issue fixed quickly. For photographers, there is almost nothing greater than having a social media presence; with just one viral photo, your name could be seen by thousands, if not millions, of people. The SocialMe WordPress theme integrates your website into nearly every single social media website, including Facebook, Twitter, Instagram and Pinterest. In just the click of a button, you or your readers can share any of your photos or blog entries on their social media accounts. 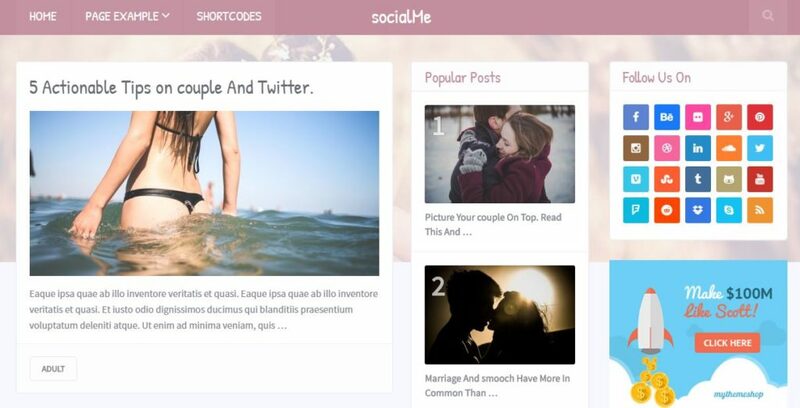 The SocialMe WordPress theme is also fully compatible with the WooCommerce plugin, letting your readers not only share your photos but buy a copy for their own use. For some photographers, their photos are meant to be just one part of a larger picture. For example, someone who primarily takes pictures of political conventions may want to add their thoughts and commentary to each of their photos. The Blogging WordPress theme allows you to do just that, thanks to its custom widgets and sleek design. 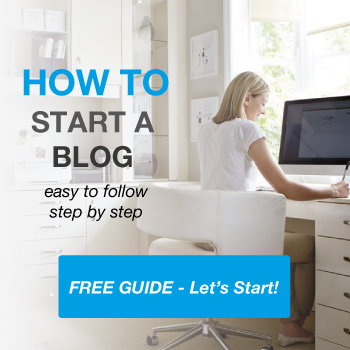 The blogging theme features an intuitive design that places equal importance on both your photos and words alike, enticing readers to continue reading after each article. The Blogging WordPress theme features SEO implementation so you can rest assured that your articles get maximum exposure on search engines. Much like the Adventure WordPress theme, the Parallax Pro WordPress theme is all about telling a story. The Parallax theme keeps your pictures in their proper order by using a vertical design that lets the eye quickly move from one image to the next. You can even divide your photographs into parts to create an actual storybook feel. The Parallax Pro WordPress theme also includes the ability to add up to five widgets to your home page, a customizable header and a responsive design that works fantastic for both mobile and PC users alike. One of the greatest compliments a photo can get is that it makes the viewer feel like they are a part of the picture. 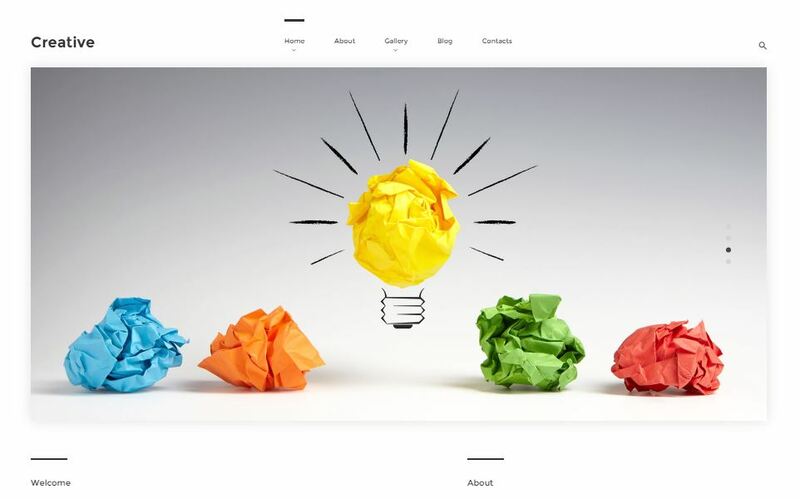 The Ambiance Pro WordPress theme helps create a personal connection with your reader by offering a minimal style that places the emphasis solely on your photos. The Ambiance Pro theme allows you to customize not only the layout of the home page but also overall aspects of the theme as well, such as adding a landing page. This theme allows you to adjust every aspect of the color, so you can give your photos a visual pop that draws the reader into each and every one. When showing your work to a prospective client, you want to lead with your best foot forward. 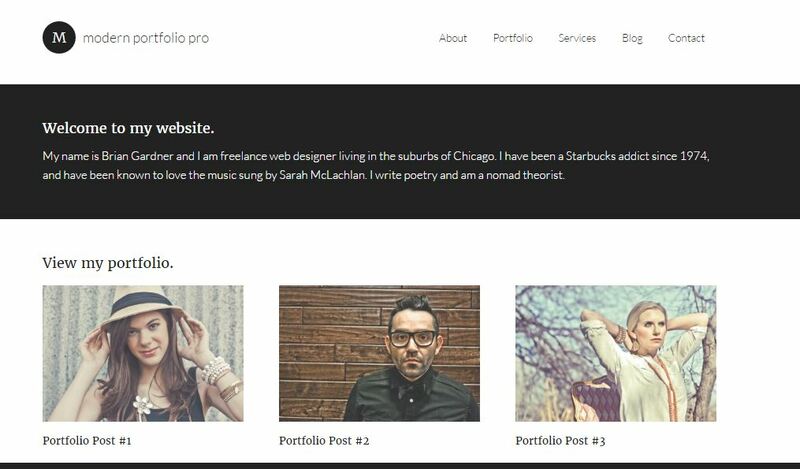 The Modern Portfolio Pro WordPress theme does just that by offering a sleek design that puts the emphasis directly on your photos. This theme offers a large degree of customization, letting you place your brand in the header and change the colors to match your company’s colors. If you’re a WordPress novice or just don’t have the time to customize your website, you can use one of the premade templates to get your site up and running in a matter of minutes. 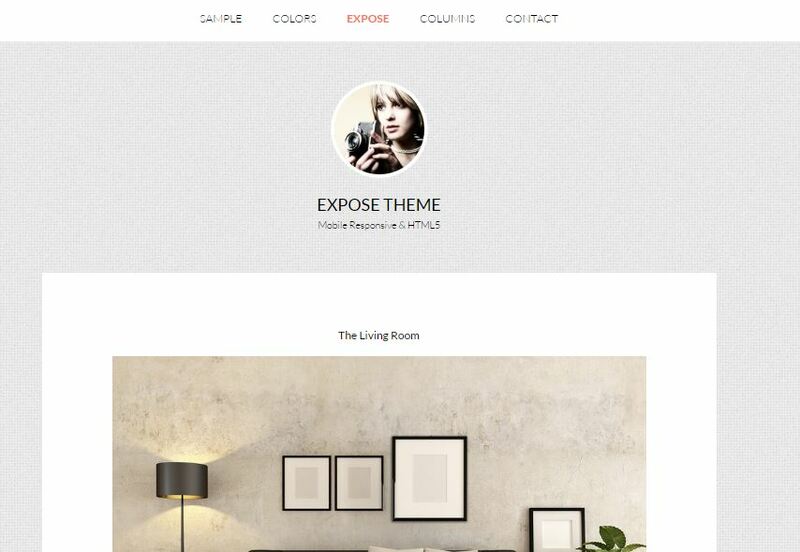 The Expose WordPress theme lets you expose your photographs to a wide audience thanks to its translation-ready features. Your audience can even comment on your photos and talk to each other using the threaded comments feature. The Expose WordPress theme is also mobile responsive, letting users who visit your site on a tablet or smartphone enjoy all the same features as those on a PC. The ability to add a custom background using this theme lets you display one of your photos at all time while using a customized header will let you get your logo front and center in front of your viewers. The Director of Photography WordPress theme also includes sliced PSD files, making it easy for novices to create a beautiful looking site while giving WordPress experts the tools they need to take their website to the next level. 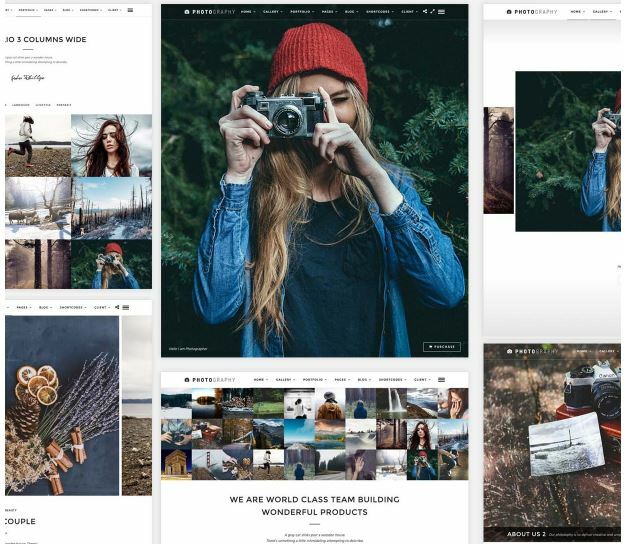 The Creative WordPress theme lets you unleash your inner creativity thanks to its MotoPress Slider, a tool that lets you arrange your pictures into slideshows and even add transition effects between each slide. The inclusion of WPML makes it easy for you to display your site in multiple languages and broaden your audience on a global scale. The contact form makes it easier for readers to reach you and for potential clients to hire you for their next photography job. Lastly, the search form lets your viewers find their favorite photos in your catalog. The PixelArt WordPress theme comes packed full of every feature a photographer could ask for in a WordPress theme. Not only does this theme feature parallax scrolling and a responsive interface but it also includes an auto-update feature and support for all the leading Web browsers. This theme is an excellent choice for novice WordPress users thanks to all the documentation it comes with, not to mention the ready-to-use shortcodes available right at your fingertips. With a variety of theme options and layouts, you can customize the PixelArt WordPress theme into anything your mind envisions. Why not check out some of my other photography related posts such as The Best Gifts To Buy A Photographer, Best Laptops for Photo Editing or my amazing Lightroom Keyboard Shortcuts infographic. I’ve also written an epic guide on The Best Free Online Portfolio creators. Yesterday i lost my patience.. with bluehost.. as they do not show – the free templates at worldpress.. they only shows the paid ones..
Then i vent to wordpress.com and made a new blog, here where over 100 free templates to choose from.. But now i would like to take this new worldpress blog into my Bluehost account .. How To ?? Once you have installed WordPress to your server, you can then login to your dashboard, go to themes and add whatever free theme you wish to use. You can search for themes via WordPress.org once you have it installed. Saw on web that wordpress does not support Borano. Any comments? However don’t you think WordPress is a little over complicated for photographers? I mean for every new feature you need to find an appropriate plugin and for even a slight change in design needs you to get into coding. A photographer should be spending more time outside taking pictures rather than designing a basic portfolio website. I’ve recently shifted to Pixpa and it has been a great decision. Every feature that a photographer needs is already present without the need to code. Flexibility is much lesser than WordPress, but for a photographer like me it seems enough.